Here you can find our scientific information and facts about Killer Whales / Orca Whales. This collection of Killer Whale Pictures mostly shows Orca Whales from the Northern Resident pods. These Killer Whale Pictures are taken from the Northern Vancouver Island region, British Columbia , including Johnstone Strait, Robson Bight, Queen Charlotte Strait, Broughton Strait, Telegraph Cove, Port McNeill and the big Pacific Ocean North of Port Hardy. Thinking about a trip to see Orcas? Make sure to read this great information about whale watching on of Vancouver Island, British Columbia. Make sure to see this photo gallery of whale watching pictures which we have collected over many years off Northern Vancouver Island, there are over 1200 Images. Whale watching pure from kayaking with Killer whales as well as images from the larger Whale Watching Boats in the Area. 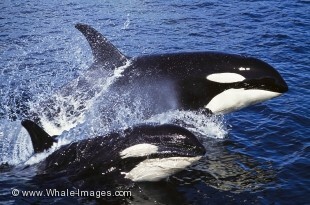 Here you can find another large collection of Killer Whale Pictures and Photos. Orca Whale computer mouse pads now available! Some of our most popular images are available as computer mouse pads: Orca Whale mouse pads.